Around the time after the Kakitsu Revolt (1441), there lived a man named Odagaki Shumesuke, a chief retainer in a prestigious family in the Hatama country of Aoyama (Modern day Himeji city). Oda lived in a magnificent mansion in the mountains. In his household was a beautiful serving girl named Hanano, who was the object of many desires. A young samurai named Kasadera Shinemon pursued Hanano, writing her love letter after love letter; but she always refused him. One of the great treasures of the Odagaki family were five precious abalone drinking cups that they had received from the lord of the clan. One day Odagaki noticed that one was missing. He questioned Hanano about the missing cup, but she could only express her surprise. 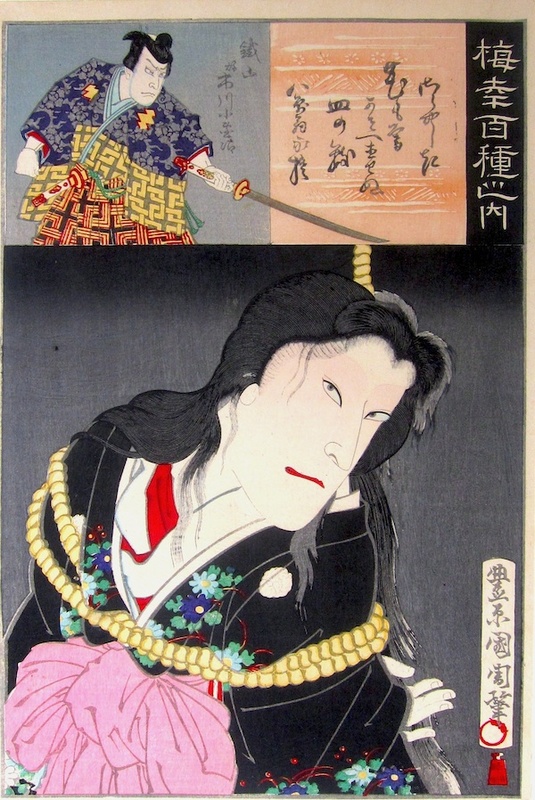 In a rage, Odagaki tortured Hanano, demanding the return of the priceless heirloom. In truth, the cup had been hidden by Kasadera in revenge for Hanano’s repeated rejections. Kasadera eagerly joined in the persecution, beating Hanano severely while demanding return of the cup. Finally, while bound and hanging from a pine tree, Hanano died. From then on, the terrible power of Hanano’s rage could be felt at the mansion every night, and the tree from which she died became known as the Hanging Pine. A samurai named Hattori lived in the Ushigome area of Edo. His wife was surpassingly jealous. One day the wife discovered that her husband’s mistress had broken one of the ten heirloom plates that the house had from Nanking, rendering them unsuitable for service to guests. The wife would not take money, but insisted that the mistress replace the broken plate. As the plates were quite old and rare, the wife knew this was an impossible demand. Until the matter was settled, the wife had the mistress confined to a cell. She was given neither food nor drink, and the wife expected she would starve to death. However, on the fifth day the wife checked in and found the mistress still alive. Out of patience, the wife took matters into her own hand and strangled the mistress in her cell. She then paid to have her body taken from the house. To everyone’s surprise, the mistress suddenly revived insider her coffin and begged for release. Exasperated, the wife paid four strong men to strangle the mistress, and bury her body in an unmarked grave. With the deed done, the wife thought she was at last free of her rival. But suddenly, the wife’s throat began to swell. She could no longer swallow food, and even had difficulty breathing. A doctor came to attend to her, but it was too late. The doctor could find no cause for her condition, and decided it must have been the onryō of the mistress coming for revenge. Later, it was found that the four men who had killed the mistress had died in the same way. The Yoshida Mansion sits in the 5th ward of Ushigome-Gomon. The lot on which it was built was once the home to the palace of Lady Sen before she made her journey to Akasaka in Edo in 1626. After that, another building once stood in that lot which was burned down to the ground—the home of the minor lord Aoyama Harima. In the house of Aoyama a young girl named Okiku worked as a maidservant. On the second day of the second year of Jōō (Jan 2nd, 1653), Okiku accidently broke one of the ten precious plates that were the heirloom of the Aoyama clan. Harima’s wife was furious, and said that since Okiku had broken one of the ten plates it was fair to cut off one of Okiku’s ten fingers in return. The middle finger on her right hand was chosen, and Okiku was confined to a cell until the punishment could be carried out. During the night, Okiku managed to slip her bonds and escape from her cell. She ran outside and threw herself into an unused well, drowning at the bottom. The next night, from the bottom of the well came a woman’s voice. “1 … 2 … “ Soon, the sound of her voice could be heard echoing throughout the mansion, counting the plates. Everyone was so terrified their hair stood up all over their bodies. Harima’s wife was pregnant, and when she gave birth her child was missing the middle finger on its right hand. News of this made it back to the Imperial Court, and the cursed Aoyama family were forced to forfeit their territories and holdings. 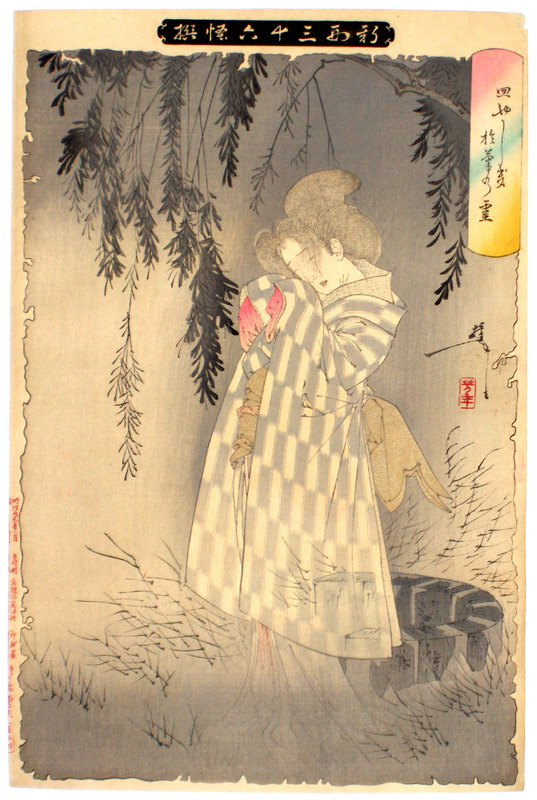 Okiku’s yūrei was heard to whisper “Oh, how glad I am” before she disappeared. 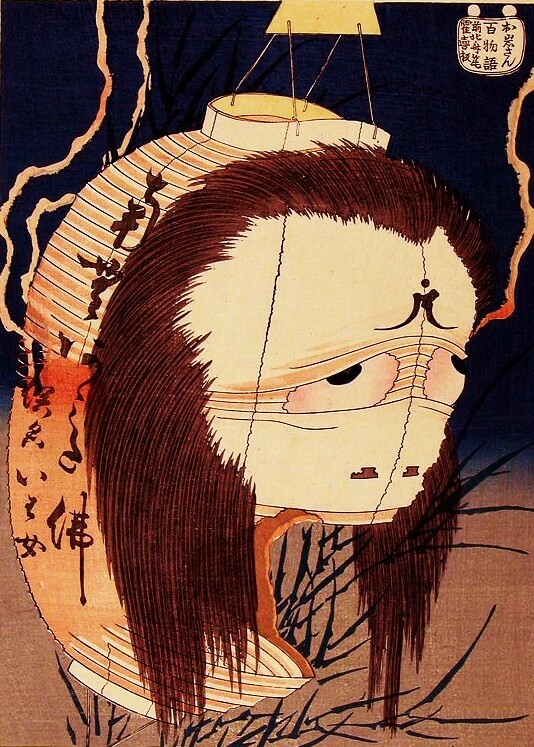 I just finished editing the Okiku chapter for my upcoming book Yurei: The Japanese Ghost and figured I would post these translations as a little preview! There is lots more about Okiku in the book itself. 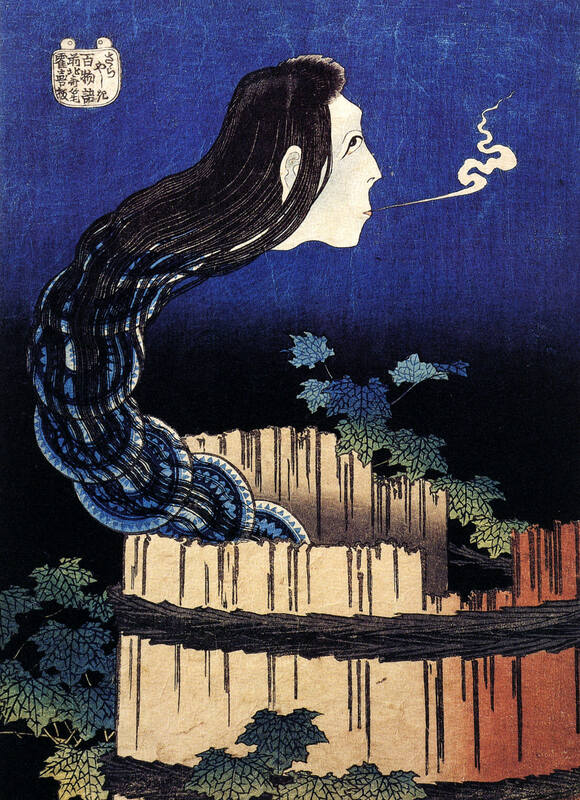 Okiku is one of the most interesting yurei in Japan. She is a true folktale, with multiple versions spread across the country. Anywhere there is an old castle and a well, there is a legend of Okiku. She isn’t always named Okiku, and she isn’t always counting plates, but the same details are there. Here are three translations of some different versions of the legends. I started with the oldest, so you can see how the tale has changed over time. Over the course of learning about her, Okiku changed from a yurei I thought was kind of boring, to one of my favorites. She is the most Japanese of Japan’s famous ghosts. And I hope people aren’t getting too sick of my sales pitch, but if you can PLEASE preorder my book! I cannot emphasize enough how important preorders are going to be for my book’s overall success. If you enjoy my translations and articles on hyakumonogatari.com, the best way to support the site and show appreciation is to preorder a copy of my book! Thank you!! !